Pictured in a custom two tone finish. Custom finishes on kitchenette furniture need to be ordered by phone. 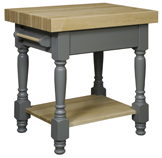 This compact and innovate table is excellent for someone working with limited space. The Camden his very versatile with its ability to seat eight people and two to three drawer storage capacity. It's also available to order withan 18" butterfly leaf. Width x Length Sizes: 42" x 42", 42" x 48", 48" x 48", 48" x 54"
Customize your kitchenette furniture with options in our drop-down boxes (shown top right). edge grain top with oil finish. Custom finishes need to be ordered by phone. 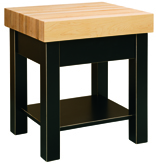 You can change the style of the butcher block top but the thickness will remain the same. end grain top with oil finish. Custom finishes need to be ordered by phone. Pictured in oak with FC-11043 Hoosier Special custom stain. Custom finishes need to be ordered by phone. Our traditional Tea Cart is ideal for use in the home or in the hospitality business. 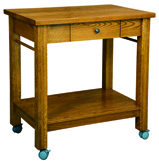 This cart is sure to add beauty and charm to your kitchen or dining area. The middle shelf is also a pull out tray. Stocked finishes require 3-5 weeks for delivery, and custom finishes require 10-12 weeks for delivery.